National College for High Speed Rail (NCHSR) is well on track to open its doors to students in September 2017 following the installation Jewers’ Swift-SEW high speed, automatic bi-folding doors to complete the external structure of the workshops at both Birmingham and Doncaster campuses. NCHSR brings all skills development for the rail industry into one College based over two sites to address the national shortage of British students with world class skills that will be required when the High Speed Rail project commences construction. The College will provide a real work environment that is geared towards informing and preparing students new to the industry and existing workforce with the highly technical engineering skills required to build, operate and maintain HS2 and future rail projects. Designed by Bond Bryan Architects, both campuses include large-scale workshop areas that will incorporate machinery and scale model areas as well as the capacity for full size power cars and carriages. Access for rolling stock is by rail tracks, which extend from the external to the internal workshop areas, and the openings are secured by the Swift-SEW-(FG) doors. There are two 5m wide by 5m high doors at Doncaster and a single 4m wide by 6m high door at Birmingham. The Swift-SEW door is the latest generation folding door from Jewers and is specifically designed for the rail industry. Each door comprises four leaves, with two leaves folding to each side on the inside of the building and gliding smoothly across the rail tracks. Leaves are operated by a powerful centrally mounted SEW drive unit and the control system incorporates inverter control for smooth start and stop and takes less than 10 seconds to open the door fully. 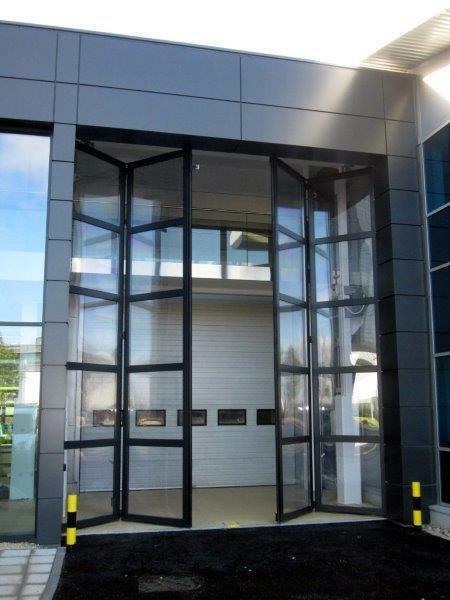 Safety is ensured with full height pressure sensitive safety edges, a pair of photocell beams to create a safe zone around the door and internal traffic lights. Both campus buildings, including the workshops are fully glazed to provide high levels of natural light and allow maximum visibility both inside and out so external passers-by can engage with the building and the activities within. The workshop doors at both sites are also fully glazed to maintain this concept and ensure conformity with the overall style of the building. Please note: As the building is still under construction, the picture used above is a library image of the fully glazed Swift doors.